ATTO ExpressSAS® SAS/SATA Host Bus Adapters (HBAs) provide high-performance data protection to direct-attached SAS and SATA storage. ExpressSAS HBAs are ideal for increased connectivity and maximum performance for data center flexibility. ATTO ExpressSAS HBAs are available with a wide selection of 8, 12 and 16 port options to support a dense connection to storage from rack-mounted servers and workstations in datacenter, data warehousing, video on demand and other high availability, high performance applications. ExpressSAS 12Gb HBAs combine 12Gb/s SAS speeds and x8 PCI Express 3.0 with powerful hardware and software elements to manage latency in real-time environments. ATTO exclusive Advanced Data Streaming (ADS™) Technology maximizes CPU processes to deliver smooth and reliable data transfers and the highest consistent performance. Disrupted transfer with peaks and drops. Transfer rate dips below optimal performance levels. ATTO ADS™ technology stabilizes data streams, providing more optimal throughput than the competition. ATTO 12Gb ExpressSAS HBA drivers are architected for multi-CPU platforms. ATTO NUMA aware hardware drivers consider the I/O patterns to ensure that driver resources are located close to the system I/O resulting in reduced latency for streaming and high IOPS workflows. ATTO ExpressSAS HBAs feature PowerCenter Pro, a game changing software technology that adds hardware RAID capabilities at the cost of a host bus adapter, and without additional drivers or complicated set-up. PowerCenter Pro is the most effective way to improve performance while also protecting data. ATTO ExpressSAS HBAs consume up to 40% less power than competitive offerings and delivers a significant reduction in data center electric and cooling costs. ATTO ExpressSAS HBAs draw 40% less power than the competition. 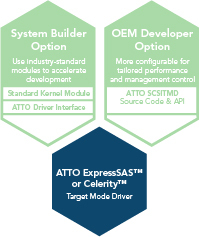 OEMs and system integrators can take advantage of ATTO Target Mode Software Development Kits (SDK) or industry standard driver options to create unique branded storage and appliance solutions. Through a more tightly integrated driver, an ATTO ExpressSAS SDK provides integrators complete control, ownership and flexibility in creating custom capabilities to address specific product designs. Extensive operating system support includes major software releases for Linux®, Windows®, Windows Server®, macOS®, illumos, VMware EXSI Server®, and FreeBSD.